This recipe yields six servings of pasta; consider one egg and 3/4 cup flour per portion. 1. Form a ball. On a marble or wooden work surface, pile the flour into a mound. Make a well in the center of the mound. In a small bowl, beat the eggs, salt, and olive oil together with a fork until blended, and then pour them in the well. Continue beating the egg mixture with the fork, gradually drawing in flour from the sides of the well until the egg has been absorbed by the flour. If needed, drizzle a small amount of warm water, and continue mixing. Once the dough has formed, clean your hands and the work surface. 2. Knead and knead (and knead). Flour the work surface again. Knead the dough: press the heel of one hand deep into the ball, keeping your fingers high, then press down on the dough while pushing it firmly away from you. The dough will stretch and roll under your hand like a large shell. Turn the dough over, then press into the dough, first the knuckles of one hand, than with the other; do this about ten times with the knuckles of each hand. Then repeat the stretching and knuckling process, using more flour if needed to prevent sticking, until the dough is smooth and silky, for about 10 to 20 minutes. Roll the dough into a smooth ball. 3. Rest. Place the dough in a small bowl and cover with plastic wrap. Let the dough rest for at least 1 hour at room temperature or up to 1 day in the refrigerator, before rolling and shaping the pasta. If the dough has been refrigerated, let it stand at room temperature for at least 1 hour before rolling and shaping. 4. Roll. Shape the dough into a rough circle. Lightly flour the clean work surface. With a rolling pin, begin rolling the dough as you would a pastry crust, starting in the center and rolling away from you to the outer edge. Turn the dough a quarter-turn, and repeat, working your way around, until the sheet of dough is 1/8 inch thin or less. Scatter a small amount of flour on the dough whenever it starts to stick to the surface or the rolling pin. Italian tradition dictates that the sheet of dough be transparent enough to read text beneath. 5. Shape. From orecchiette to lumache, there are hundreds of shapes of fresh pasta. For a simple hand-cut tagliatelle, gently roll the sheet of dough around the rolling pin, and slip it off onto a clean, lightly-floured work surface. Cut the roll of dough into strips the desired width, then gently lift them in the air and drop on a dishtowel, separated. Repeat with the remaining sheets of dough. 6. Cook. Fresh egg pasta cooks in a flash (think: 10 to 15 seconds). As soon as it rises to the surface of the heavily-salted cooking water, it is likely ready. A taste test will show if it is al dente enough. 7. Serve. 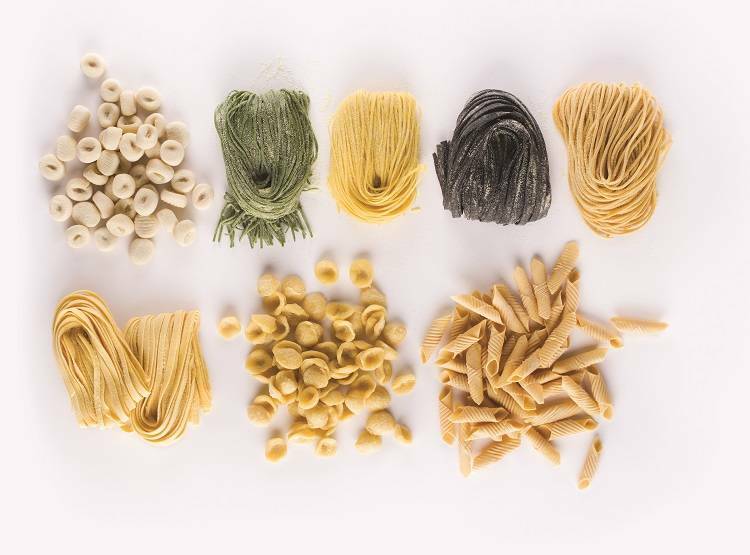 Every pasta variety and shape pairs uniquely with various sauces. Tagliatelle's ribbons are delicious with a heavier sauce featuring meat or seasonal vegetables. There are so many ways to get creative with fresh pasta! Below are just a couple examples, but you can make it your own. Green Spinach Pasta: Use about ¼ pound of fresh spinach per egg/portion. Cook the spinach in boiling water until it is wilted (only a minute or two). Squeeze the spinach dry, then chop as finely as possible. Add it to the flour well with the eggs in step 1, and proceed. Serve with meat sauces. Black Squid Ink Pasta: Use about 1 tablespoon of squid ink per egg/portion. Add the squid ink to the flour well with the eggs in step 1, and proceed. Serve with seafood sauces.